Puspasari, Triana (2005) Hubungan Antara Komitmen Bergama Dan Subjective Well Being Pada Remaja Akhir. Skripsi thesis, Universitas Tarumanagara. Subjective well-being is an evaluation of life quality from cognitive evaluation (life satisfaction) and affective evaluation (positive affect and negative affect experience). In colloquial term, subjective well-being is labeled "happiness". People high in subjective well-being on average have a number of desirable qualities, such as good emotional control, and face many things on their lives with a better way. Therefore , high subjective well-being plays an important role in late adolescent who is accrossing the life span, from childhood through adulthood. There are many resources correlating with subjective well-being and one of them is religious faith. Lately, some researches found the intensity of religious’ life rising in late adolescents . 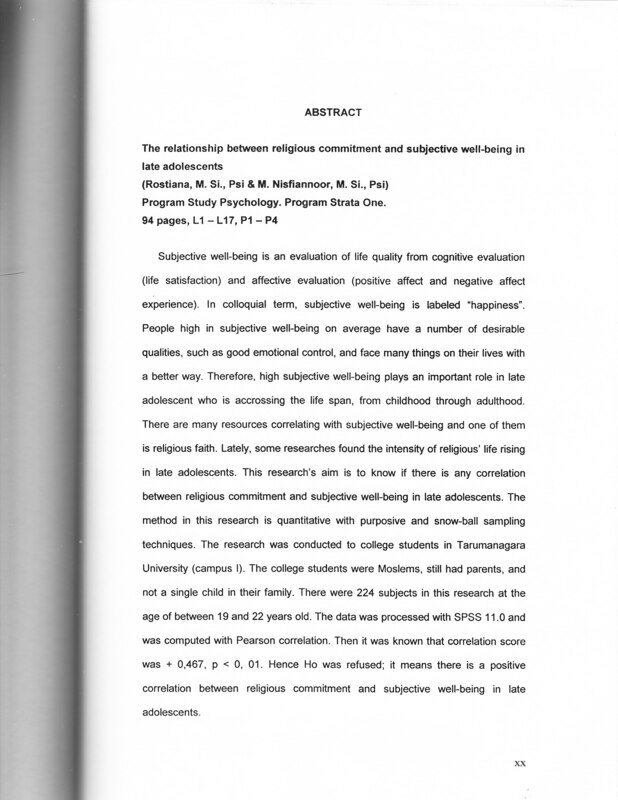 This research's aim is to know if there is any correlation between religious commitment and subjective well-being in late adolescents. The method in this research is quantitative with purposive and snow-ball sampling techniques. The research was conducted to college students in Tarumanagara University (campus I). The college students were Moslems, still had parents, and not a single child in their family. There were 224 subjects in this research at the age of between 19 and 22 years old.The data was processed with SPSS 11.0 and was computed with Pearson correlation.Then t was known that correlation score was + 0,467 , p < 0, 01. Hence Ho was refused; it means there is a positive correlation between religious commitment and subjective well-being in late adolescents.